Letterpress finds us all and captivates us in one way or another. Benjamin Eakin of E. W. Card Crafts is no exception. From a rich printing history with his father in the newspaper business in Quanah, Texas, to navigating the transition from the old-school style of hands-on typesetting to the digital and modern age of letterpress printing, Benjamin has taken up the gauntlet of the challenges of starting a new part-time letterpress business. Armed with a small but mighty Craftsman Superior (that rode shotgun in his car on the return journey home after acquiring it), he is testing out the waters and is finding himself discovering new projects, a new greeting card line and championing the zealous ambition all letterpress printers share: the dream of getting back on press for just a little bit longer. A RETURN TO LETTERPRESS To my utter dismay, I find I will soon turn 64. No idea at all how that happened but, well, here I am. I’ve worked at many things over the years, including a 16-year stint with my father and our book publishing company, software support for a book publishing software company, some time with a CPA, and my current position is the cash office of an international kidney dialysis company, among other things. Eakin Press originally published mainly Texas history and began as an extension of Nortex Press which had been printing county histories for a number of years. In turn, Nortex Press started as an extension of the Quanah Tribune Chief newspaper for the express purpose of printing county histories. 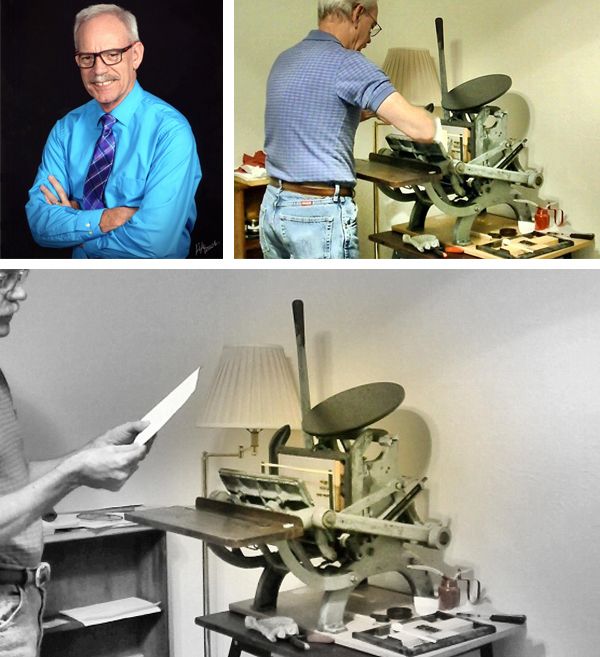 PRINTING TRADITIONS I grew up in the newspaper business in the 50s and 60s in north Texas. My father was the editor of the Quanah Tribune Chief in Quanah, Texas. At the time, the population was about 5,000. When we moved there when I was five, the newspaper had letterpress presses only. Even after a new building was built, the presses were moved the block down the town square to start a new life there. Our pressmen and Linotype operators were all a little rough around the edges but that only served to make them more interesting. I worked at the newspaper collating papers and doing cleanup for many years. Not everyone in town knew my name but most everyone knew me as “Little Ed” – that editor’s kid. That made it rather difficult to get away with much. 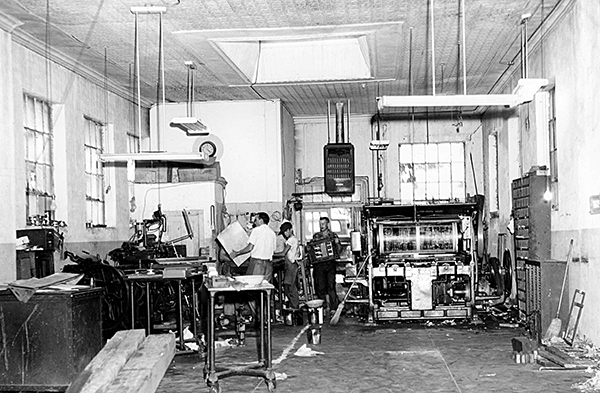 Eventually, the newspaper switched to offset presses but kept the Linotype and one or two of the letterpresses for job work. I used to deliver funeral notices to the stores on the square since this was a weekly paper and Wednesday might be too late to get the word out about a recent death in town. 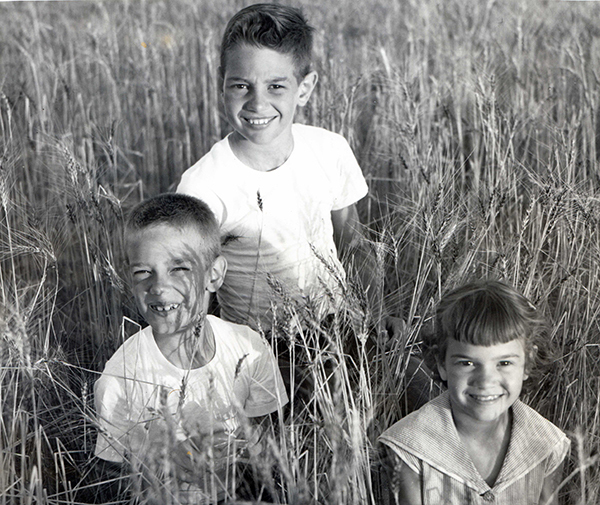 My brother, sister, and I did a lot of posing for photos to accompany news stories – for instance, posing in a wheat field for a story about that year’s crop. My father’s gone now and I’m afraid I don’t remember all the presses that were originally in the shop. There are some great memories, though, about the noise and smell of the press room. 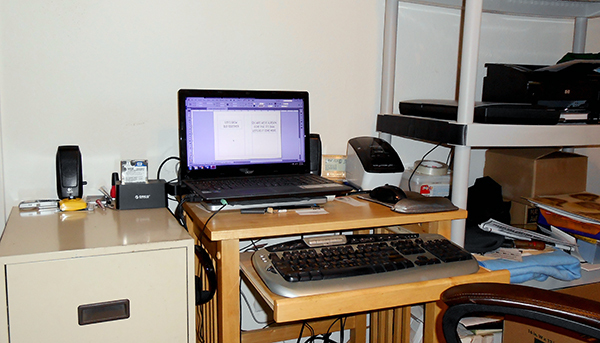 I used to do the design and book layout for the book publishing company after years as the production manager. I was the one to first bring in a PC to test out typesetting on a personal computer instead of our dedicated Penta typesetting system. We gradually transitioned to PCs only. The designing I do now for the greeting card line, in addition to writing the text, has mostly to do with choosing a typeface for each card. My intent with the cards is to focus solely on the words to paint a visual picture for the recipient. We are so bombarded with images today that I cherish the chance to use my imagination to come up with its own visual. I’d like to think there’s a niche audience for the words I write and the look and feel of handcrafted cards. 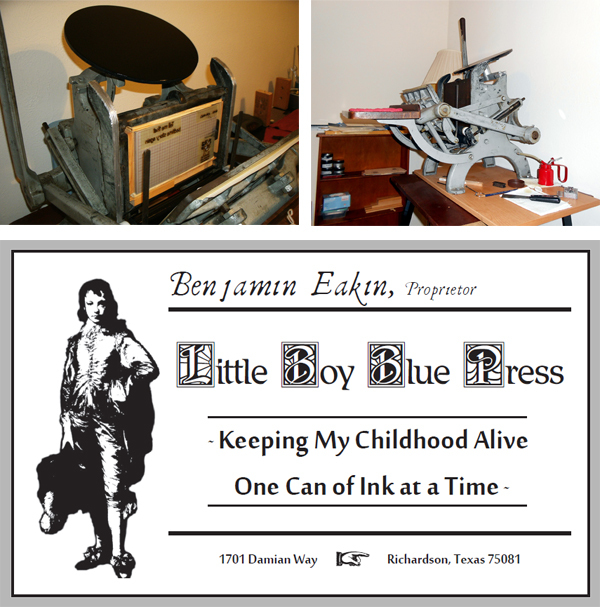 PRINTING IN THE LONE STAR STATE My current shop is a small bedroom at home that operates as my home office and now home to my Craftsmen Superior press. 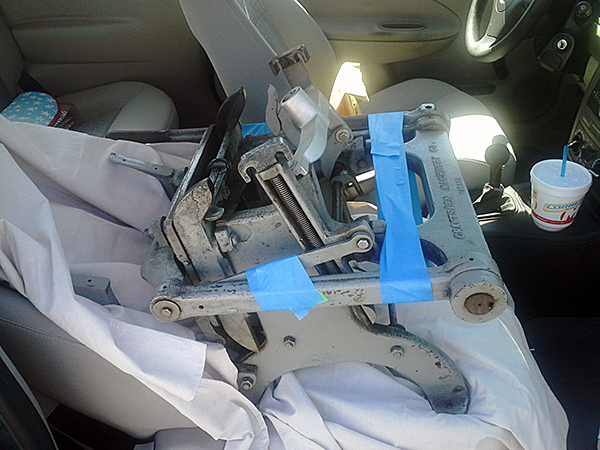 I purchased the press last year from a couple who’d purchased it a couple of years earlier in New York. They ended up moving to Houston, Texas and life apparently got in the way – babies and such. I found it on Briar Press and met the sellers just north of Houston to pick it up. The press rode in the passenger seat of my car for the trip back to Richardson – a part of the Dallas metroplex. PART TIME PRINTER, FULL TIME FUN Sadly, I don’t print full time. In fact, the new online store was pushed back several months after I agreed to be a cousin’s executor. Sooner than expected, she died in late March of pancreatic cancer and several things were placed on hold as I tried to figure out how to handle that new job. My goal with the new online store, Quite Simply Cards, is to try to put myself in a position to give up my “day job” and concentrate on printing my greeting cards. I’m hopeful I can transition to printing full-time sometime in 2017. E.W. Card Crafts is named after my partner Tom Hayes and I. Edward is my middle name, William is Tom’s. Hence, E.W. – or Edward-William. 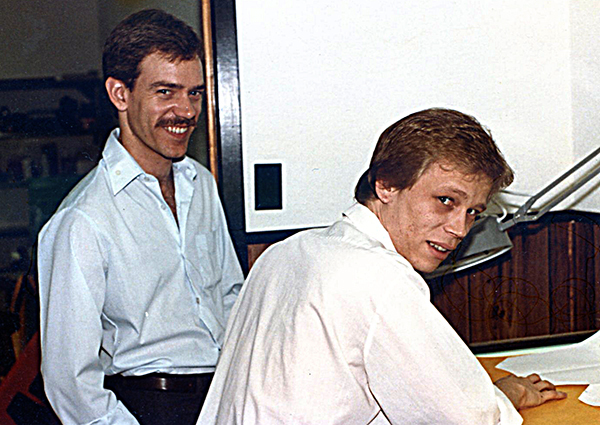 We both worked for Eakin Press for many years in the past.The 1980s photo supplied of the two of us shows me on the left and Tom on the right. We’re a tad older now. PRINTING FEATS I tend not to see my own accomplishments and rely on other people to point out that I’ve done something worthwhile. Yeah, I’m working on that rather poor self-image thing. Recently, however, I printed Shakespeare’s Sonnet 154 for the Oxford Bodleian Library’s call for entries to print all 154 of Shakespeare’s sonnets to commemorate the 400th anniversary of his death. While I pushed it to almost the deadline, I managed to get my entry there on time. I printed the sonnet under my private press name Little Boy Blue Press. I was a fun challenge taken on for the pure enjoyment of it. BOXCAR’S ROLE Boxcar Press has been there from the beginning with help in determining how I was going to set up my press. That included walking me through why I really needed to work with InDesign to produce print-ready images for ordering the polymer plates. I also now have two of Boxcar’s Deep Relief bases to help in a faster setup and press change for printing. Answers to questions have always been readily available from Boxcar. PRINTING TIPS Neat tricks? Well, I’m a little too new to have much in the way of tricks except for one thing. 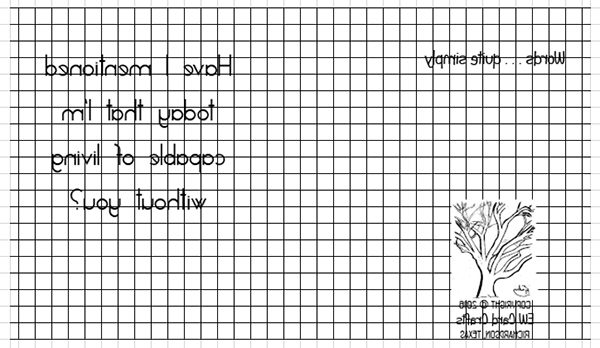 Since my greeting cards all have the same basic layout, I’ve set up Excel files with a representation of the grid on my Boxcar base. I export the type for a card to a PNG file with transparency. Once I position the polymer plate exactly where I need it, I place the type transparency in the Excel file for that card. Now I know exactly how to position the plate for subsequent runs of that card. Also, setting up one card aids in quickly positioning a new card since I can position based on the previous card – if the saying is wider than the previous card, I can center the type for the new card over the previous and so on. I save a file for each greeting card for quick reference. WHAT’S NEXT Plans for 2017? Hopefully, I’ll be able to print full-time. No plans right now to expand beyond the greeting card line but would like to think we’ll be successful enough to perhaps purchase something like a C&P 10×15. That would be too large for my home shop, so would mean finding a small commercial office. That’s the goal in the long term. I don’t see myself officially retiring. I have no reason to believe I’d be happy without some new project in my life. And it seems I never tire of finding new projects. We’re cheering on Benjamin as he starts his new greeting card line and a huge round of thanks to him for letting us get the scoop on his wonderful printing heritage. Catch him here on Facebook!